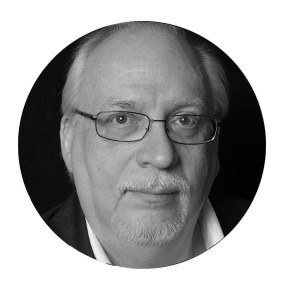 J. Michael Straczynski is a screenwriter, television polymath, comic book writer, and novelist, and one of four speakers at our next Seriously Entertaining show, This Is Not the End, on September 20. Prolific doesn’t really cover his output. Indeed, the 34 writing credits on his IMDb page only hint at the extraordinary range and volume of his work, which includes the vast majority of Babylon 5‘s 110 episodes (he created the show), the 2008 Clint Eastwood movie Changeling (for which he was nominated for a BAFTA), zombie-apocalypse epic World War Z, seven instalments of Murder She Wrote, and, alongside co-creators the Wachowskis, the entirety of last year’s Sense8, one of Netflix’s most ambitious and successful original productions. Ahead of September’s show, we spoke to Joe about getting drunk with Nixon, the length of the working day, and why Peter O’Toole would be the ideal candidate to record his collected works. Name: J. Michael Straczynski. My friends call me Joe. People who don’t like me also call me Joe. I find this vaguely disquieting. Where are you from? Technically I was born in Paterson, NJ, but my father was a notorious deadbeat who moved from town to town and state to state about 21 times my first 17 years to avoid debts, so I don’t really consider myself as being “from” anywhere. Except the past. Like everyone else I did travel here from the past, which is a quantum state, so that was the state I was born in. What is your occupation? Writer. Sometimes producer. Mostly writer. I’ve written over 500 articles for publications such as the San Diego Reader, the Los Angeles Reader, the Los Angeles Times, the Los Angeles Herald Examiner, Writer’s Digest and others. In TV I’ve written almost 400 produced episodes for shows like the new Twilight Zone, Murder She Wrote, Babylon 5, Sense8 and a bunch of others, often as a producer or show-runner. My film work includes Thor, Changeling (the one Clint Eastwood did, not the horror movie) and World War Z among others. Title of most recent work: Sense8 [see trailer below]. The first season is still currently available on Netflix, and we are in the process of shooting Season 2 right now. What are you working on now? Helping out with two film projects for Legendary, writing a movie for MGM based on my Rising Stars graphic novel, writing a series pilot for Universal based on my Midnight Nation novel (it’s been a good year for my GN work), developing a pilot for ITV, just finished another pilot for CBS Studios, finishing up the last of my work in comics, almost done writing my autobiography, and starting my first novel in many years. Otherwise pretty slow. If you had to paint a scene from your childhood to capture its essence, what would you paint? Me on the ground getting the crap kicked out of me by bullies. This is what happens when you’re always the new kid and always the weird kid. What is your petite madeleine? She’s 5’1″, works in a library, and asked me to tell you to leave her out of this. Which day in your life would you repeat? Which day would you delete? Repeat: The day before the premiere of Changeling at Cannes. For the first time I realized I could stop going through my life like a man running for a bus, trying to prove something to people who had stopped thinking about me years ago. Delete: The day this freaking questionnaire arrived in my email box. What do you most look forward to? Really, it’s just the writing. I love what I do. I get up and go right to the desk first thing every day, and stay here until it’s time to crash. Sometimes (more than I care to admit) I eat at the desk so I can keep going. I write 12-14 hours a day on average; sometimes a bit less, often a lot more. From time to time I think about slowing down, traveling more, maybe taking the first vacation I’ve had since 1994, but then I get an idea and I’m off chasing stories again. What do you hope future civilizations will find in the miraculously preserved shell of your house? My reading glasses, because I can never find the goddamned things and would be mightily impressed if someone else could do it. What are you reading right now? The Catcher in the Rye. What was the last great film you saw? If the emphasis is on the very last one that I saw, rather than the last one produced, then it would be Lost Horizons. If you could play any character on the stage, who would it be? I don’t know, but it would have to be a character who came onstage just once, said the funniest line in the entire production, then ran offstage, as I don’t have the courage for anything more than that. If you could live inside a fictional world, which one would you choose? Living inside a fictional world would require that it be hollow, and I can’t think of many that fit that criteria. Given sufficient budget, what would you put on your wall? The heads of several studio executives. Who, in music, strikes deepest in the soul? The answer to that is constantly changing depending on the disposition of my soul at any given moment. Who in history would you most like to have a stinking-drunk night out with? I don’t drink, but if there’s anyone from history I’d like to see drunk it would be Richard Nixon. I’d wait until he was too inebriated to defend himself then hit him in the face with a snow shovel, really really hard. What are your preferred writing materials? Words. What’s your favorite font? Garamond. What’s the loveliest book that you own? A limited edition of Prayer for the 70s by Norman Corwin. Where would we find your favorite bookstore? London. Who would you choose to read the audiobook of your collected works? Peter O’Toole as he could make even my crap sound amazing. How do you celebrate the completion of a piece of work? Usually by starting the next piece of work. If it’s something exceptional, I go out and buy something that I will always associate with that project. So the actual object depends on the nature of the work. You can see J. Michael Straczynski at the Seriously Entertaining show This Is Not the End on September 20, 2016, at Joe’s Pub at The Public Theater. Buy tickets here.